In 2002 Triumph wanted to exploit the fact that they hit their centennial first. They pushed the fact to dealerships to make sure the customers all knew which company was older, therefore had more history. In honor of the 100th anniversary of Triumph motorcycles the company released the T100 model starting with a limited run of the “Centennial” edition. But on March 15th the factory had a crippling fire allowing only a handful of bikes to emerge unscathed. The run was then pushed to the fallowing year, with about 500 total models produced. With a familiar look in trying to hold fast to the classic Bonneville style the T100 is still produced today. Motone USA is a top to bottom one stop shop for aftermarket parts for later model Triumphs. Based out of Roanoke Texas, the young company was looking to feature their products and ideals in a way that showed the full potential. But when you’re trying to have the perfect spokes model built finding someone that you trust and shares your same vision is never easy…or is it? Well, it’s easy if your neighbor is Kyle Shorey of Shadetree Fabrications. See both Shadetree and Motone share the same building and both Motone’s Dale Crawford and Kyle have a great respect for each others work, so the decision was easy. 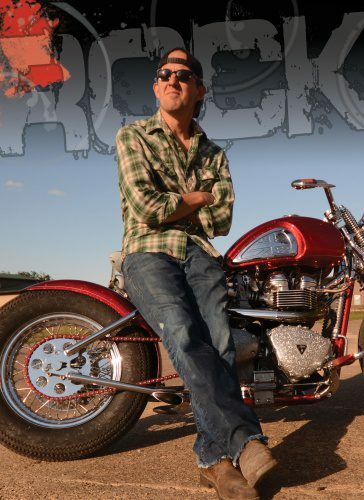 Shadetree was started in 2005 and over the years has become the first place to go for specialized Harley Softail parts. For Kyle, this was a special circumstance build for a special customer. 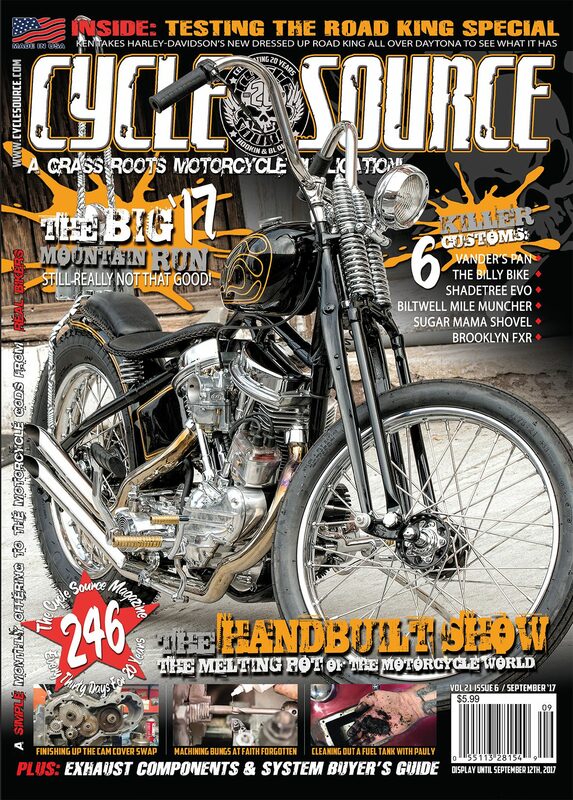 Shadetree produces a limited number of bikes and rarely are they customer builds, but a challenge is rarely dismissed. The 2004 T100 all in all took eight months to come together. With other priorities on his plate Kyle fit the project in when possible, always trying to keep it fresh and moving forward. The frame sports a stock rake with no stretch and a hardtail done by Cycle One in Locust Grove, OK.
Kyle cleaned the frame and the welds and showcased Motone’s own fuel tank, cap, and seat pan. The frame came with a Mid USA rear wheel which Kyle matched for the front along with a Mid USA springer. The entire purpose of the bike was to draw attention without taking away from the products and risk being overbearing so it was decided that the frame was to be chrome plated. 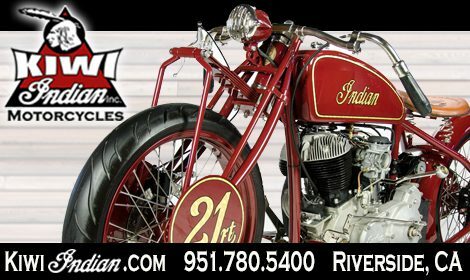 Being that the engine cradle is a separate piece it was painted to match the tins by Liquid Illusions in a candy apple red with gold flake to give color to the bottom of the bike. The motor was in turn punched out and adorned with intricate side covers that Dale had done by a kid in India. The clutch was beefed up to handle the motor with a set of Keihin carbs feeding the frenzy. 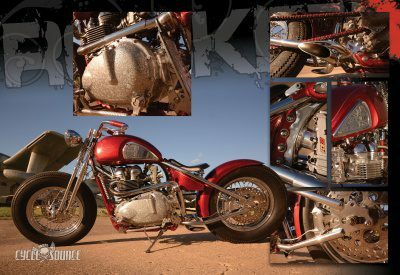 Shadetree was able to accent the Triumph with their own magic and one-off details with custom exhaust, battery box, and beautiful controls finely tuned to work with the original Triumph pieces. For only being Kyle’s second Triumph build, his attention to detail remains unmatched. Giving a later model motorcycle the slight tweaks and exaggerations needed to obtain a classic European look. 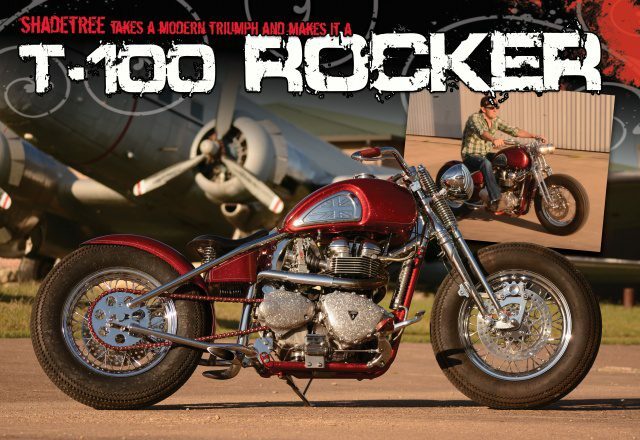 As it turned out, the T100 was finally completed to match the release of the Triumph Bobber. The T100 has not gone unnoticed wherever it shows, taking numerous awards including The Ultimate Builder. Kyle may never produce another one but at least we were able to witness his talents on the one he did. Make sure to check out Shadetree Fabrications on the web and don’t forget Motone USA for those late model Triumph accessories and more. This entry was posted in Feature Bikes and tagged August 2018, Back Issue, Custom Bike, Cycle Source, Cycle Source Magazine, Feature bike, T-100 Rocker, Triumph. Bookmark the permalink.